You are here: Home » Get Involved » Donating saves lives. Are you in? Thank you donating to Susan G. Komen Northwest Ohio®! 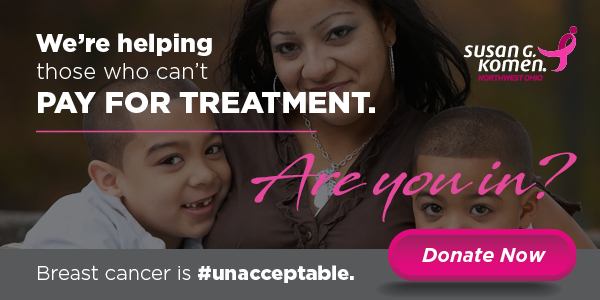 Your donation will help Komen Northwest Ohio® provide breast cancer screening, diagnosis and treatment services within our local community—because everyone deserves access to timely, affordable, and high-quality breast health care. Plus, thanks to the generosity of the Mark S. Feldstein Private Foundation Challenge Grant, your donation will be matched dollar-for-dollar up to $10,000! Your gifts also support state-of-the-art, national research focused on finding the cures for breast cancer.